Road diet bike lanes recently being installed on Pershing Drive in Playa Del Rey. Photo by Joe Linton/Streetsblog L.A. 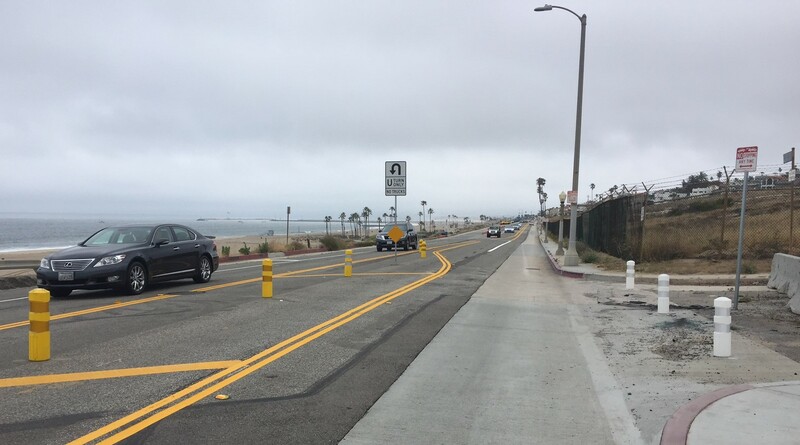 Working with L.A. City Councilmember Mike Bonin’s office, the Department of Transportation (LADOT) is installing various street safety measures in L.A.’s Playa del Rey neighborhood. 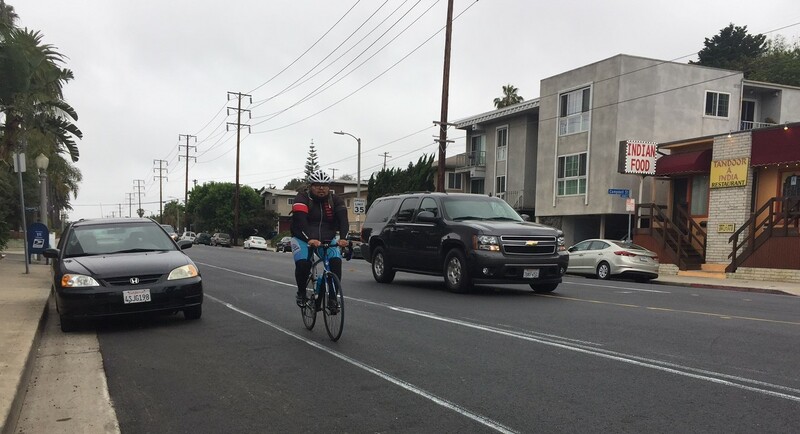 The “Safe Streets for Playa del Rey” project includes new bike lanes, safer crosswalks, and road diets on portions of Jefferson Boulevard, Culver Boulevard, and Pershing Drive. As part of an immediately adjacent, but separate project, the city also reduced travel lanes and reconfigured parking on Vista Del Mar. The safety improvements are being installed, with completion anticipated later this month. 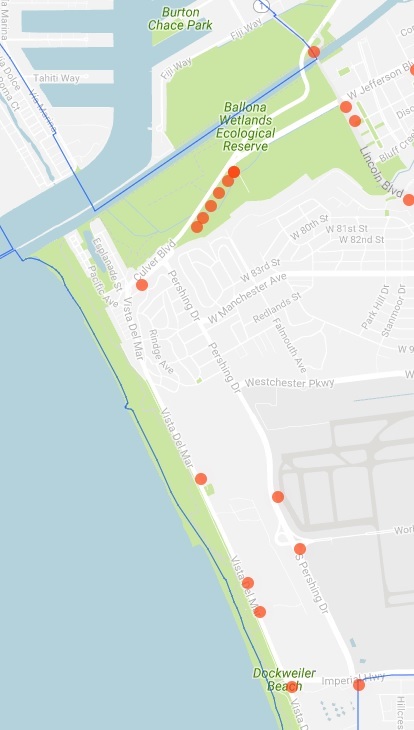 The Playa del Rey projects are in response to speeding, deaths and serious injuries on these streets, as well as community interest in making Playa del Rey (PDR) more a livable beach community and less, in Bonin’s description, “a short-cut from the South Bay to points north”. 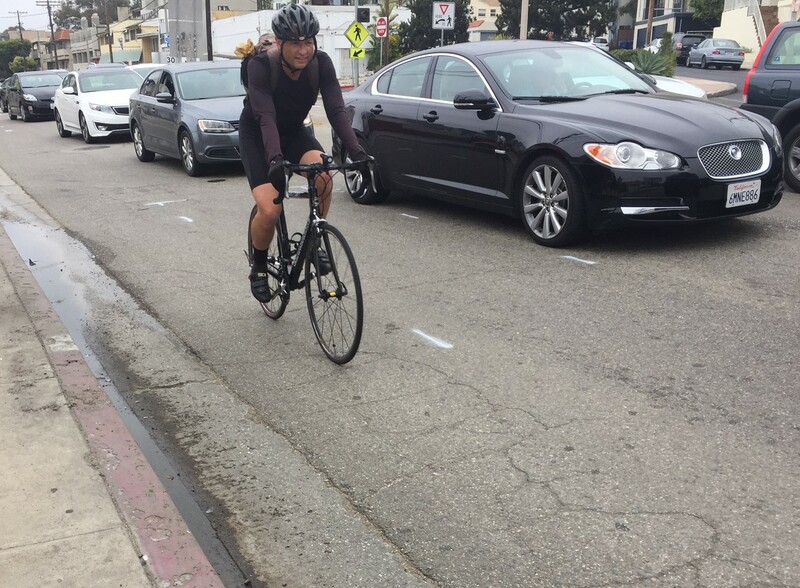 According to Bonin’s Mobility Deputy Jessie Holzer, PDR residents began working with Councilmember Bonin’s office in 2015 with a goal of slowing speeds, reducing cut-through traffic, and making PDR more pedestrian-friendly. Residents prioritized calming on Pershing Drive and Culver Boulevard. Bonin’s staff and LADOT had several project meetings with community leaders, including sharing a conceptual project plan in 2016. The project includes Pershing, Culver, and Jefferson. Street reconfiguration got underway during the past week, coinciding with resurfacing of a portion of Pershing Drive. In a separate and adjacent project, LADOT is also reconfiguring Vista Del Mar. For many years, there has been parking on both sides of Vista Del Mar, so folks who park on the inland/east side of the street would walk across four lanes of car traffic to access the beach. The four lane configuration was also dangerous for drivers, who frequently crashed due to illegal U-turns, often in pursuit of beach parking. According to LADOT, from 2003 to 2016, this stretch of Vista Del Mar saw driver deaths in 2005 and 2010. It saw pedestrian deaths in 2005, 2006, 2010, 2015 and two in 2016. There were also 210 collisions involving serious injuries on Vista Del Mar from 2003 to 2016. These break down into 156 vehicle/vehicle, 20 were pedestrian/vehicle, 9 bicycle/vehicle, and 25 fixed object/vehicle. Two recent pedestrian fatalities have driven home the seriousness of the situation. While walking across Vista Del Mar in 2015, Naomi Larsen was killed by a car. Similarly Michael Lockridge was killed by a car in 2016. For Larsen’s death, the L.A. Times reports that L.A. recently paid a $9.5 million legal settlement because “the city had failed to ensure safe ways for pedestrians to cross from the beach to their parked vehicles on the street.” Further “city lawyers said it would be difficult to defend the case because Los Angeles had failed to take steps to protect beachgoers despite repeated collisions in the area.” According to The Argonaut, a similar Lockridge case against the city is pending. As of just over a week ago, the city took steps to make Vista Del Mar safe. Parallel parking was removed from the inland side of the street. Beach-side parking was expanded by converting parallel parking to diagonal. According to LADOT the overall on-street beach parking was expanded by 90 spaces. 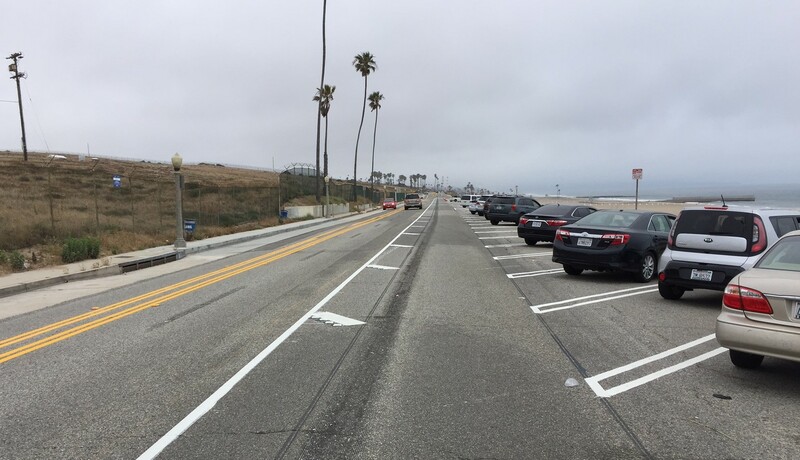 In order to make space for the expanded beach-side diagonal parking, two Vista Del Mar traffic lanes were eliminated, overall reducing four lanes to two. The project also added three designated areas for safe U-turns. With most of the Vista Del Mar project complete, some frustrated drivers are organizing against the safety improvements. Critics of the projects have formed a Keep Vista Del Mar Open Facebook group, a @Keep_VDM_Open Twitter, and an online petition against “One Lane Madness”. Safe streets supporters started a counter-petition supporting Bonin’s efforts. Road diet reconfigurations of Pershing Drive, and Culver and Jefferson Blvds got underway this week. As of yesterday, preliminary street markings are visible, with permanent thermoplastic striping expected shortly. This weekend the Pershing upgrades will extend further south, coinciding with a second phase of resurfacing – from Manchester Avenue to Westchester Parkway. Last night, the Neighborhood Council of Westchester/Playa agenda included a report and motion regarding the safety improvements. Television cameras were present. A standing-room only crowd of just over 130 people included both opponents and proponents of the street projects, with public comments running about 20 percent in favor and about 80 percent opposed. The item opened with Holzer and LADOT Assistant General Manager Dan Mitchell giving a status report on the projects. Mitchell characterized Vista Del Mar as a street that serves two purposes: a “commuter highway” which it performed well, and a “beach access street” which it performed poorly. He went on to speak of the city’s “moral obligation to prioritize peoples lives” and described the Vista Del Mar project as an “emergency” response to “tragic unnecessary deaths”. He apologized that the city’s outreach had been lacking and he maintained, as councilmember Bonin has, that these projects are low-cost pilots that the city will be monitoring to make adjustments based on their performance. A couple of times during Mitchell’s 20-minute presentation he was heckled by the crowd. Mostly they complained of longer drive times commuting on Vista Del Mar. Many of these commuters live and/or work in adjacent South Bay cities. Several opponents blamed neighborhood cut-through traffic on recent changes, though others stated that cut-through traffic has been a growing problem for a long time. Several opponents suggested that all Vista Del Mar on-street parking should be eliminated, including many expressing concerns that visitors leave their trash there. Bonin’s staff responded that the state Coastal Commission would not allow for any reduction in parking as that would impede the public from accessing the beach. Several opponents were critical of the city’s purported use of Measure M funds – designated to “ease congestion” – for a project that would slow down traffic. One self-identified “suffering commuter” actually read aloud from a printed copy of the Measure M ordinance. Mitchell clarified that Measure M’s sales tax does not begin until July 1, and the city will not see any Measure M funds until around September. A handful of proponents spoke of having been included in the planning process for several years. Proponents named victims of traffic violence, asserting that something needed to be done. 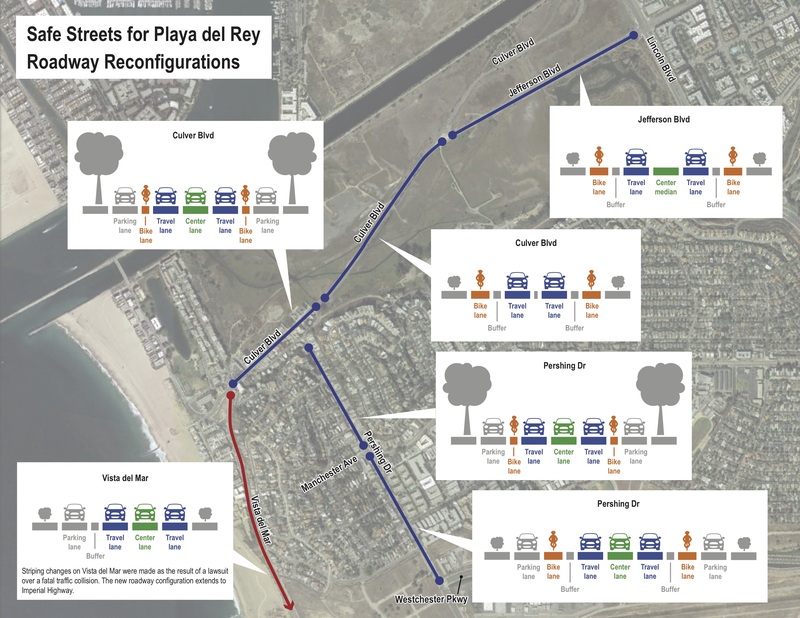 Some asked for Playa Del Rey’s main streets to look and feel more like lively beach streets in nearby Manhattan Beach, El Segundo, and Santa Monica. 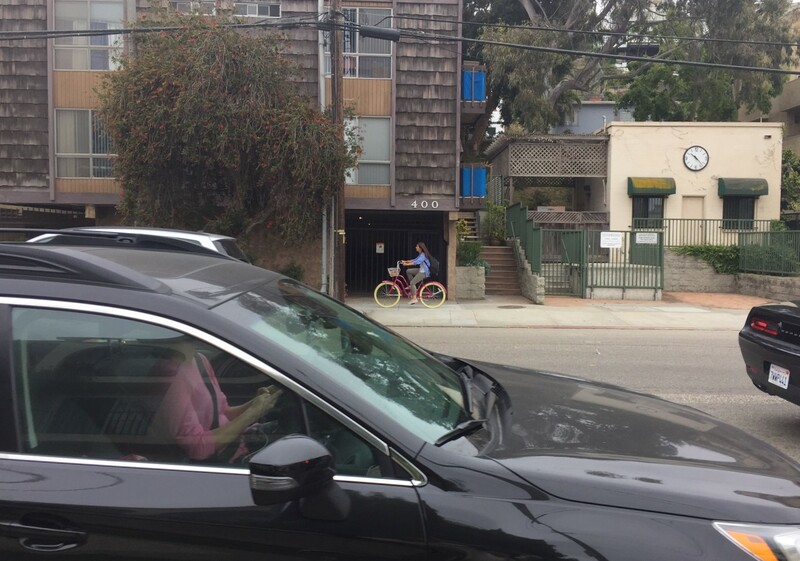 A Playa Del Rey business owner complained that speeding traffic is hurting his business, making it difficult for driving customers to enter and exit his parking lot. Some Neighborhood Council boardmembers and project critics did acknowledge that speeding and cut-through traffic were longstanding problems in the community, and encouraged the city to mitigate these, whether by police enforcement or other means. The Neighborhood Council voted unanimously to approve a multi-part motion that formed a committee, urged “immediate” mitigation measures, and requested various items from LADOT including traffic study data, metrics for project evaluation, and written responses to concerns raised. 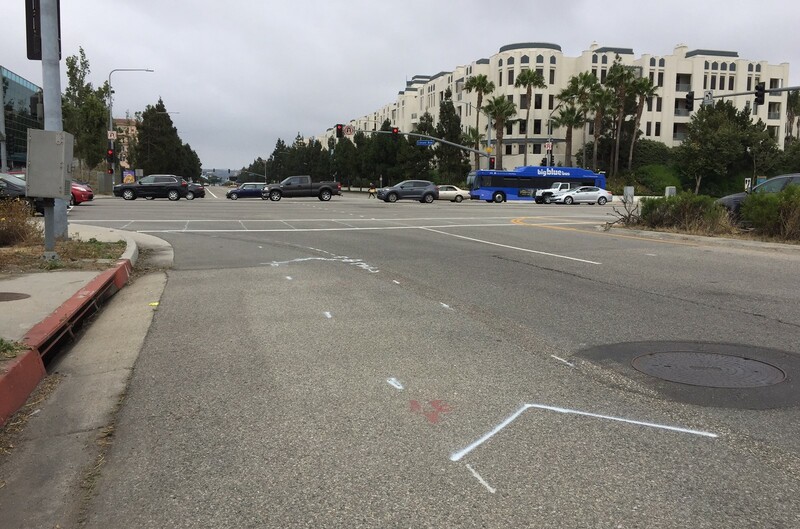 LADOT is still completing work on Vista Del Mar and striping lane reductions on Pershing, Culver, and Jefferson. LADOT spokesperson Bruce Gillman reminds road users that “construction is ongoing through June 25” and “people should anticipate delays”. As the projects progress, new concerns or new praise may emerge as construction crews depart and the public experiences the streets in their new state. those streets are all MINE !!!!!!!!!!! There is no bike lane on Vista del Mar. The empty lane on the West side of the road is for cars backing out of the angled spots. Cyclists using that lane risk serious injury from cars backing out blindly. The actual bike path through the beach is poorly maintained, often covered in sand, and, thanks to a change in regulations from a few years ago, full of pedestrians that make riding on it a hazard. The simple fact is that cyclists commuting through this area have no good route options. What all residents want is a rationale and reasonable solution to the PROBLEM. You think it’s bad now? Wait until schools start again in September. Why anyone thinks perpetual gridlock is a good thing is beyond me. Truly one of the most idiotic ideas I have ever encountered. Fix this. Please. And Bonin has to go. This is total insanity, absolutely no thought as to the damage this will do. A 10 minute run to MDR took 25 mins in the middle of the day, getting home last night took an extra 30 minutes. Idiotic!!!! please call 310-568-8772 to complain to mike bonin about the traffic!!!! Also join playdelreytraffic on twitter so we can unite and stop the madness. We just started in on twitter today. Playa del rey become a nightmare place to live over night. Thank you for reading. Every resident I’ve talked to who has to come in or out during peak periods wants Bonin recalled. Try turning left from Culver to Nicholson. Not only does it take forever without a turn signal, but you block EVERYONE trying to go straight. This is about as motorist hostile a plan as has ever been seen in Los Angeles, a city where most voters drive. If you were really concerned about pedestrian safety, you’d be against enraging every motorist to the point of irrationality. “Traffic calming” has got to be the most idiotic, paternalistic and infuriating oxymoron since, well, ever. Then, real simple, don’t ride a bike there. In fact, banning bicycles in Los Angeles might be a good idea. For the children. Sounds like you’re asserting that this project is all it took to “enrage every motorist to the point of irrationality”? Your exaggeration to speak for “every motorist” is unhelpful hyperbole. Full of trash now. Give your patrons safe parking and they express gratitude by leaving their thrash all over. It’s not an all or nothing proposition. Vista del Mar is much more pleasant now with one lane in each direction. The lanes were way too tight before. If commuters are slowed by a 3 or 4 minutes through Playa Del Rey but it makes the place more pleasant, that is not the worst trade off. The most significant commuter issue–and I think this is confirmed by looking at traffic on google maps–is the reduction of Culver blvd to one lane through Ballona Creek. Considering that a good portion of traffic is actually heading to Pershing, which offers the best alternate route to Manhattan Beach via Imperial, returning Culver Blvd to 2 lanes should alleviate most of the additional congestion. Yes, there have been traffic / pedestrian incidents along this stretch of Culver Blvd, but its because of the lack of a sidewalk (how about a parallel raised boardwalk that minimizes impact to the preserve) and no nighttime / early morning speed limit enforcement on this dark stretch of highway. With this logic and all the trash along freeways, should we shut the freeways down? Seems to me that someone (the city?) needs to install some trash cans near the parking. I hope it pisses you off so much you move. I can’t believe I’m the only one to comment here who thinks this is long overdue. It’s a BEACH, people, not a freeway. Forget about parking here and enjoying a public beach, I’ve been afraid to even drive on this racecourse at rush hour. There are too many people in LA to keep packing them into wider freeways and more lanes. And don’t blame bikes…they could just as easily put in wider sidewalks or more trees. Everyone complained when they turned Silver Lake Boulevard from a 4-lane racecourse into one lane each way, with a center turn lane. You might get delayed 5 or 10 minutes, but the accidents must have been reduced. I like to drive as fast as you, but it won’t kill you not to be able to race around every other car on the road. I’ll bet there are a few people on Highland Avenue in MB that wouldn’t mind slowing you down a bit. Why don’t you widen those streets up? Why don’t you ask El Segundo to add a few lanes to their streets? I know you live in LA, but you gotta get out of your car eventually. Most corrupt city council and mayor since the 30’s. A “road diet” in LA is THE DUMBEST idea EVER. As someone who used to live in LA I would have to say it’s obvious to just about everyone that traffic is a major problem in LA. Arguably, traffic is single worst thing about LA. Why on earth would you do something to make traffic worse? Why would you have a policy that intentionally makes your worst problem worse? Dumb. That’s under a nonsense assumption that the bike lanes are fully utilized like the car lanes. Obviously in real life most people drive don’t bike and that isn’t going to change. You are a selfish jerk who wants to whine and cry to get your way while completely ignoring the needs and wants of the majority. And you will justify this by arrogantly acting like you are morally superior to the majority. You are not. you really want more innocents to die ? Perhaps the city planners should have thought about the congestion before “permitting” all the excessive housing/condos to be built. So because *most* people use 10x the space and 20x the power they need to go somewhere they should be encouraged and rewarded for that? I am very disappointed about the Bonin/Garcetti agenda to punish Plays del Rey locals to further their “everybody ride a bike agenda” in LA. I have been a PDR resident for about ten years and traffic was always a little slow. Since this one-lane madness began I have seen four wrecks, where I had never seen one before. In Bonin’s Argonaut article he mentioned two fatalities. One was on VDM, she was killed because you let a mile and a half stretch by the beach to have no crosswalks or pedestrian over passes, even though you were warned. Would it have been cheaper to build these or pay the settlement? This was after midnight. The second was a wreck at 1:45 AM that you said was caused by a speeder at an intersection that NEVER has pedestrians. There are no continuous cross walks there. We have to live with this crippling traffic due to most likely a person who did not have a legal crossing and to use your phrase “too stupid to cross the street” and a person killed at bar closing time? So your main two arguments have major flaws. I feel sorry for both of these women, but the City, for ignoring this, The city and themselves need to take responsibility for their actions. I still have not seen a bicycle on Culver. If you wanted traffic to move better, widen Culver by one lane, put in a reversible lane and widen the overpass over Lincoln. How many of our taxpayer dollars have you put into this boneheaded idea? How much would it cost to widen Culver by one lane? Bonin described this as traffic calming. Has Bonin ever talked to one of my neighbors? signs to remind people that the one-lane congestion was a Bonin/Garcetti idea. I noticed they removed those cones from the eastbound Culver to Jefferson transition. This was a start, but it is back to a hairpin turn. The left turn lane from westbound Culver onto Nickolson is so short that if you obeyed the law you would be blocking traffic. I have no clue where Bonin or Garcetti live, but obviously it is not in PDR. I hope years from years from now when students read their Political Science books, Bonin and Garcetti will be top features of the political suicide section. Either widen Culver or put it back like it was. You have outraged a community and do not deserve to represent us. I still have not seen a single bicycle on Culver. How about people don’t jaywalk? 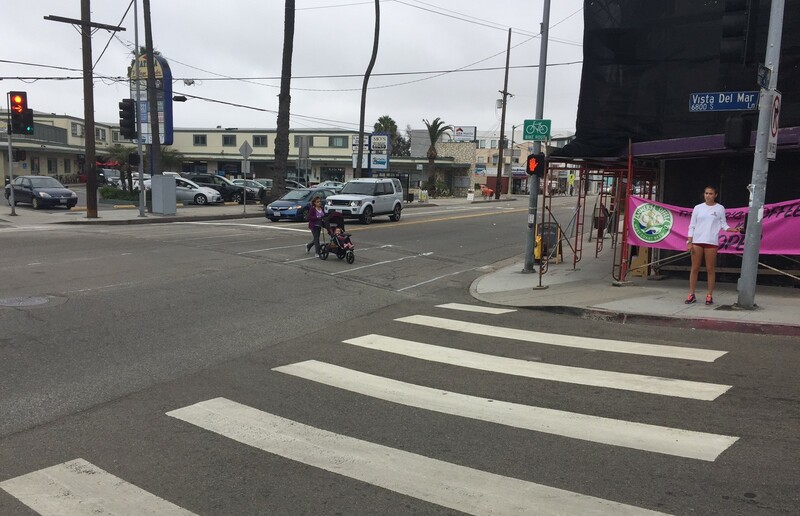 Irate drivers calling themselves "Open Streets PDR" are working to undo recent safety improvements in Playa Del Rey. Councilmember Bonin has responded that "We should never buy into the notion that convenience is worth endangering lives."